Key words: hardfacing, alloy, microstructure, precipitation. hardfacing material to be applied to special parts of various instruments, machines and plants. tensile strength of the alloy . on the microstructural changes of these alloys will also be investigated. 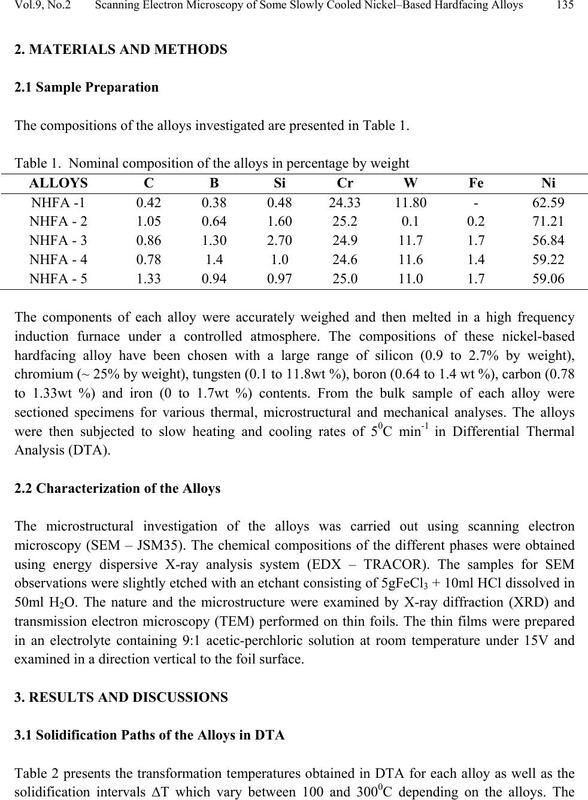 The compositions of the alloys investigated are presented in Table 1.
examined in a direction vertical to the foil surface. Table 2. Transformation temperatures in 0C obtained in DTA and undercooling ∆T. in a previous work . 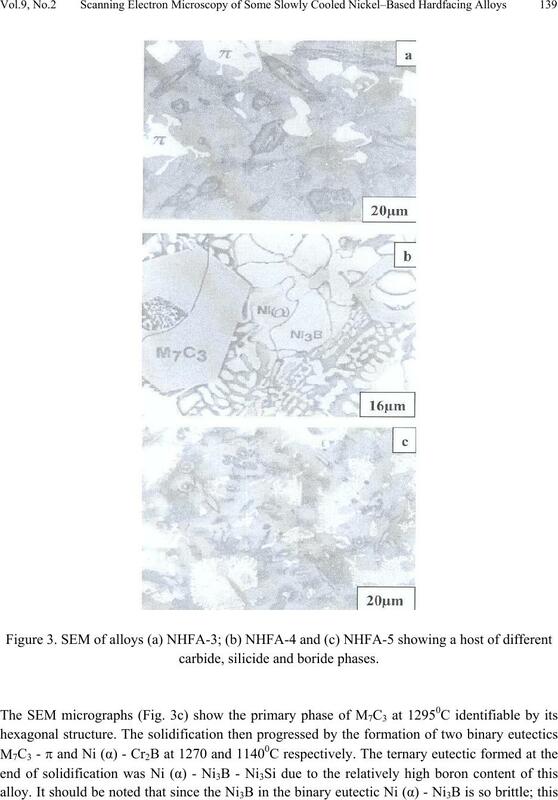 The NHFA-2 alloy shows a typically dendritic microstructure (Fig. 1b). 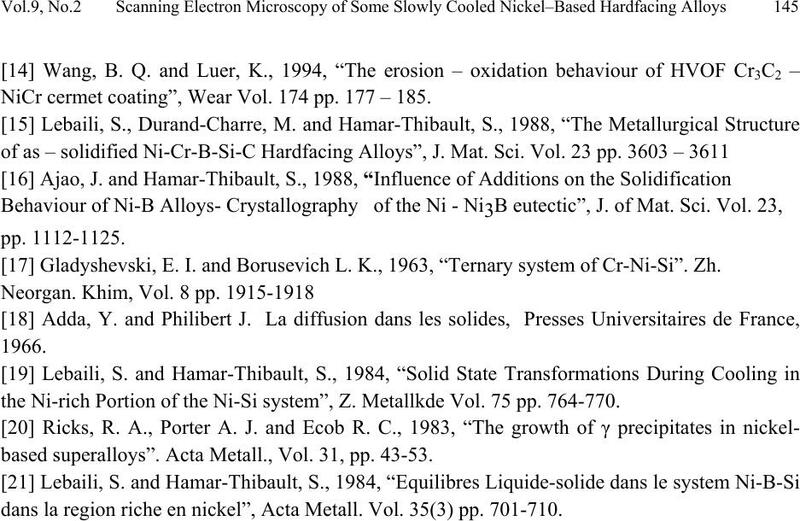 solidification of the Ni(α) solid solution. phase of Ni (α) with segregated precipitates within the matrix. of this type of structure could lead to lack of high-temperature ductility. particularly high in chromium, tungsten and silicon contents as shown in Table 3.
formation of a coarse binary eutectic between Ni (α) and Ni3B. 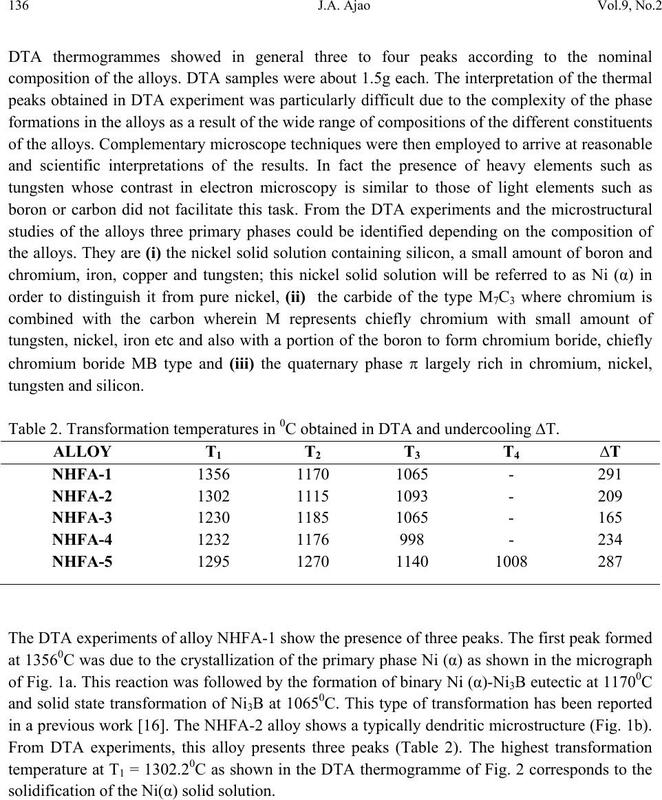 The DTA experiments of alloy NHFA-5 effectively show the appearance of four distinct peaks. carbide, silicide and boride phases. 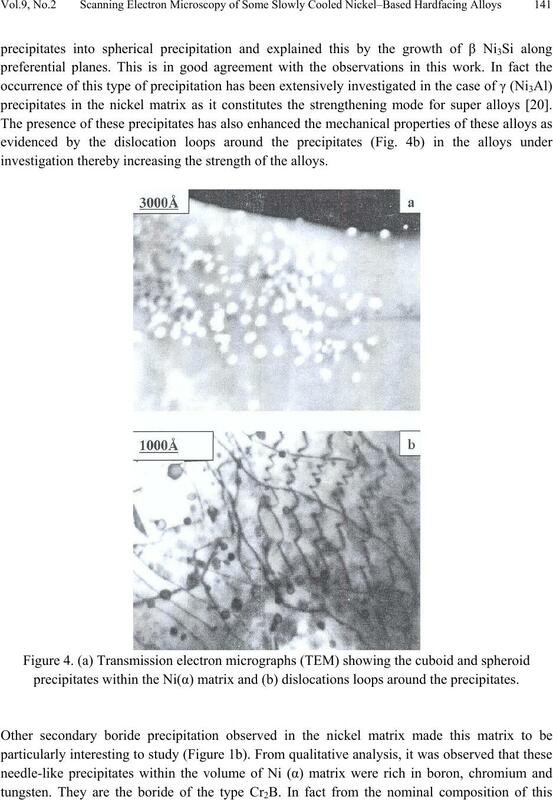 microcracks and lamellar structure resulting in exfoliation or laminar peeling – off of coatings. forms of solid-state precipitations observed in these types of alloys with iron additions. According to Adda and Philibert , DSi = 1.5exp[-61700/kT] between 1100 and 13000C. 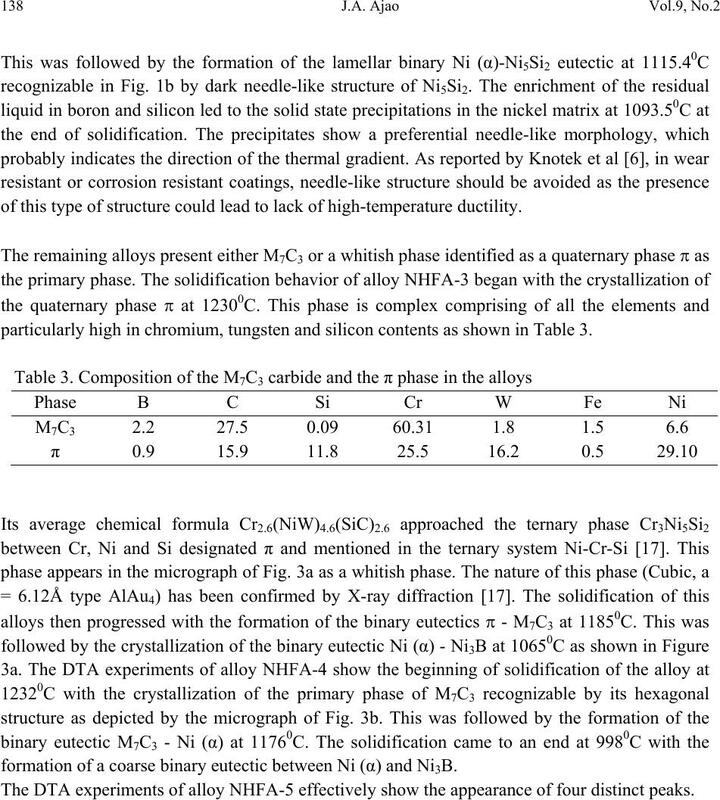 precipitates in the nickel matrix as it constitutes the strengthening mode for super alloys . investigation thereby increasing the strength of the alloys. precipitates within the Ni(α) matrix and (b) dislocations loops around the precipitates. chromium which increased the liquidus temperature of the alloys. 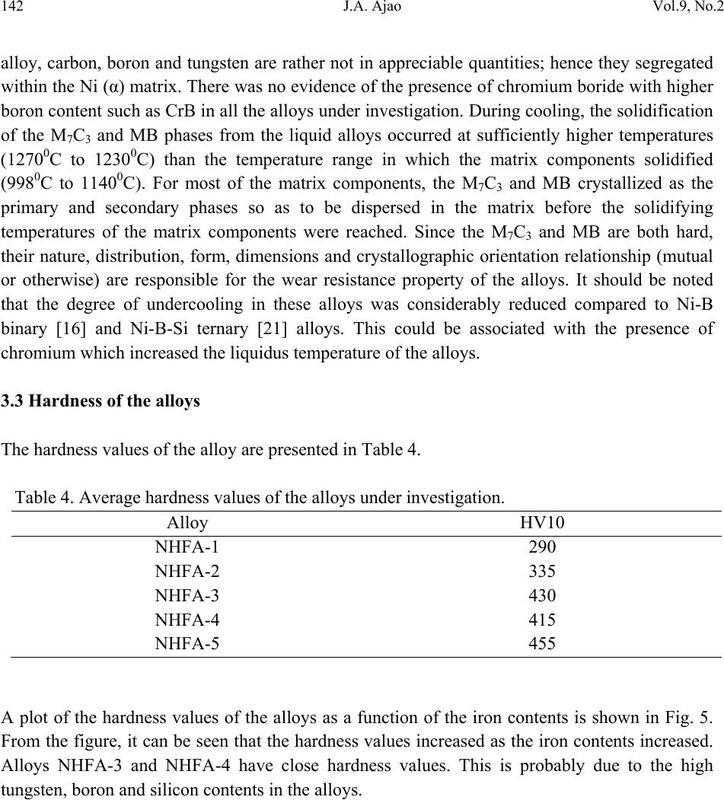 The hardness values of the alloy are presented in Table 4. Table 4. 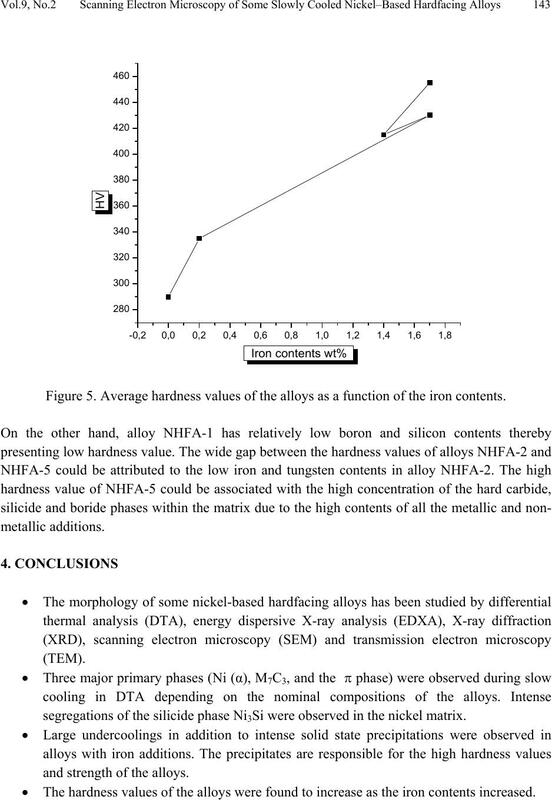 Average hardness values of the alloys under investigation. A plot of the hardness values of the alloys as a function of the iron contents is shown in Fig. 5. From the figure, it can be seen that the hardness values increased as the iron contents increased. tungsten, boron and silicon contents in the alloys. Figure 5. Average hardness values of the alloys as a function of the iron contents. segregations of the silicide phase Ni3Si were observed in the nickel matrix. and strength of the alloys. • The hardness values of the alloys were found to increase as the iron contents increased. for granting him leave of absence during the preparation of this work. Metals”, J. Weld. Res. Supp., Vol. 57 pp. 319 - 325.
behaviour of flame sprayed NiCrBSi coating remelted by flame or by laser”, Wear Vol. 262 pp. 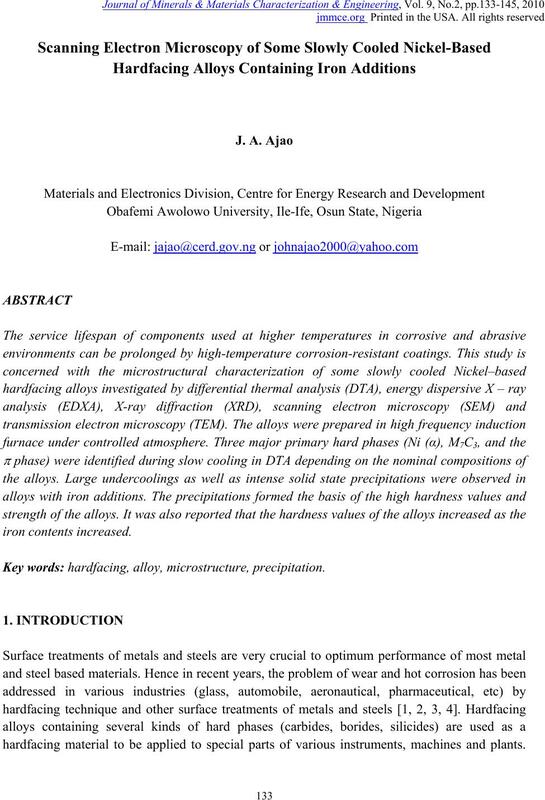 Alloys”, Welding Research Supplement pp. 314 – 318.
carbide additives in coating during fusion treatment”, Thin Solid Films Vol. 83 pp. 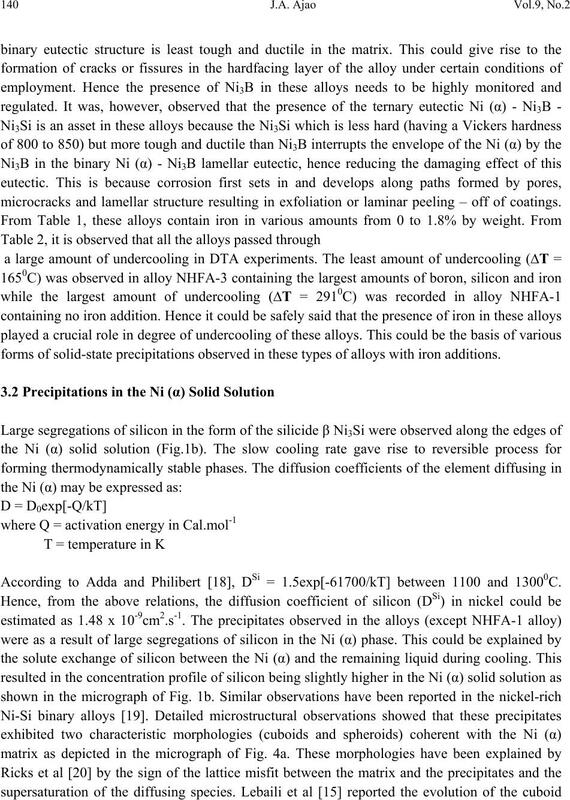 361 – 367.
and corrosion resistant Ni-Cr-W-C-Si Alloys”, Thin Solid Films Vol. 53 pp. 303 – 312.
hardfacing processes”, PM World Congress Thermal Spraying/Spray Forming, pp. 524-530. 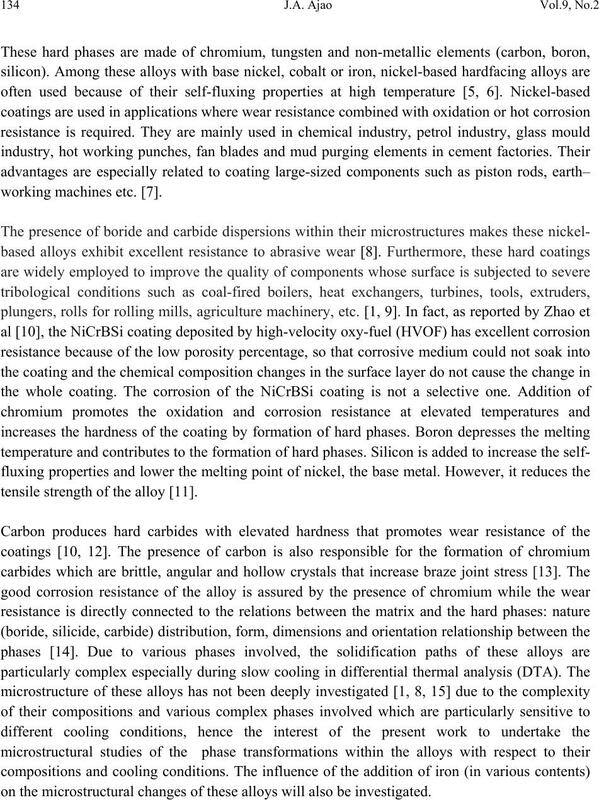 Coating Alloys”, J. Vac. Sci. Technol. Vol. 12(4) pp. 770 - 772.
obtained by different processes”, Wear Vol. 263 pp. 619–624. 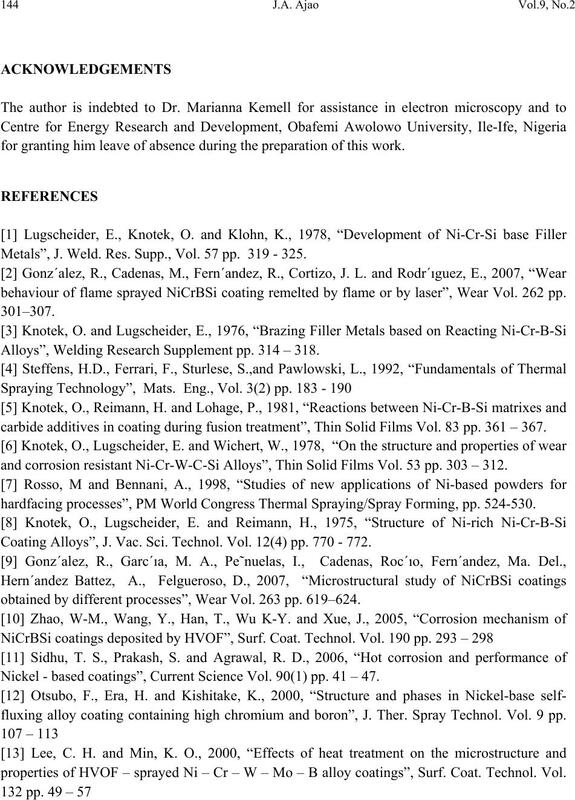 Nickel - based coatings”, Current Science Vol. 90(1) pp. 41 – 47.
fluxing alloy coating containing high chromium and boron”, J. Ther. Spray Technol. Vol. 9 pp. 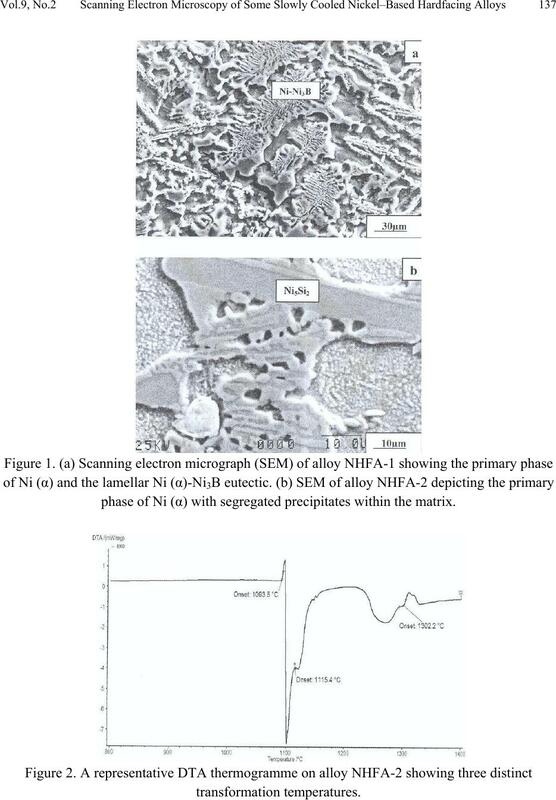 properties of HVOF – sprayed Ni – Cr – W – Mo – B alloy coatings”, Surf. Coat. Technol. Vol. NiCr cermet coating”, Wear Vol. 174 pp. 177 – 185. Gladyshevski, E. I. and Borusevich L. K., 1963, “Ternary system of Cr-Ni-Si”. Zh. the Ni-rich Portion of the Ni-Si system”, Z. Metallkde Vol. 75 pp. 764-770.
based superalloys”. Acta Metall., Vol. 31, pp. 43-53.
dans la region riche en nickel”, Acta Metall. Vol. 35(3) pp. 701-710.